When we first got this costume, we started wondering who jesters really were. Were they just the silly people in a royal court, dressed up in those ridiculous hats? Our research has shown us that, no, they weren't silly people. Sure they made jokes, and sang, some even did magic tricks. Some could even juggle balls, and perform great feats of acrobatics. And, one of their best talents was story telling. They were actually quite respected by the royalty. But, what if a jester was a little off? What if he didn't want to tell political jokes all day? Or, sing songs about great rulers of old? What if the stories they wanted to tell were about the dead rising, or the end o the world? What if they wanted to juggle, only they didn’t want to use something as mundane as balls, but rather something more nefarious? Then you would have a scary jester. And, you know all about things being scary. Your son is obsessed with scaring folks. And, every year he looks forward to Halloween, so he can scare people and not get yelled at. 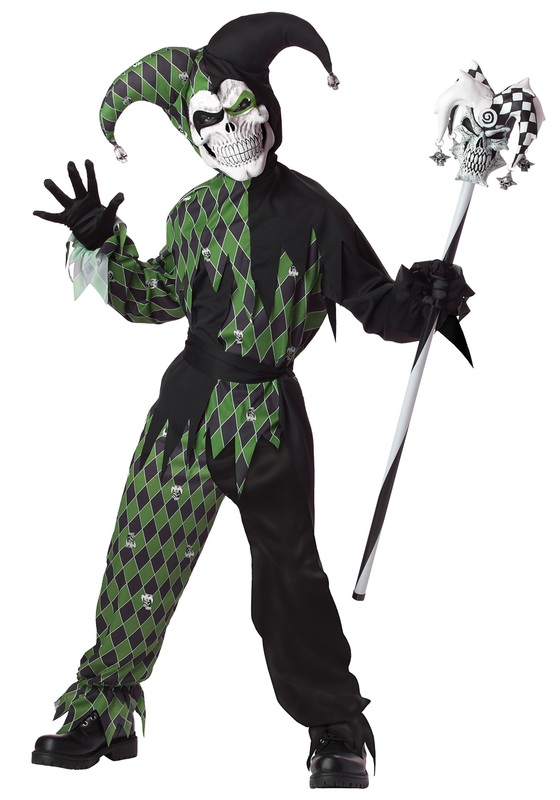 So, this year get him this Child Green Scary Jester Costume. He can regale his classmates with scary stories, and some frightful songs. Maybe, he can even do some magic tricks, like the old hole in the hand trick or show off a "mummy" finger. He'll be even more respected by even the coolest kids in the school. My son wanted this costume so badly! I couldn't find it anywhere in his size. Then I remebered Halloweencostumes.com... Not only did you have it in his size but it arrived quickly! It fit perfectly and he had so much fun wearing it! Quality was good too. Best experience from your website this year! Will remember to shop with you for all my costume needs in the future. Best price! Best selection! Best shipping! I spoke to a representative before ordering,. I ordered the costume based upon her recommendation because the size chart did not open. It is very snug. Hope my daughter will not put on any weight before Halloween lol. I could have easily gone 1 size up. Quality good. Price good too.